People ask all the time, What's the best way to cut up Brussels sprouts? Is there an easy way? A quicker way? My answer, sorry, is that it depends. 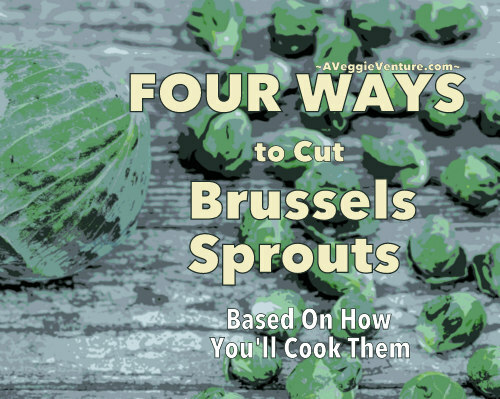 That's why I'm sharing four ways to cut Brussels sprouts. One method works best for cooking Brussels sprouts whole; another way works best for roasting and sautéeing; another for cooking quickly and lightly; still another for quick-cooking just the leaves. Step by step photo illustrations of each technique. Some times, you look at a vegetable and wonder how in heavens to cut it up for cooking. Take Brussels sprouts. The baby cabbages may look like green golf balls but take a closer look, they're really tightly bound leaves surrounding a dense core. Brussels sprouts cook more evenly when more heat reaches into the core. Brussels sprouts taste better (even to people who typically don't like them) when some of the naturally occurring chemicals are leached out when the cores are broken up. LOOKING JUST FOR A LIST OF BRUSSELS SPROUTS RECIPES? You’ll find them all here, in Brussels sprouts recipes. What Are Those Funny-Looking Stalks? A Good Way to Buy Super-Fresh Brussels Sprouts! In winter, grocery stores some times sell fresh Brussels sprouts still right on the stalk. Don't be intimidated by the other-worldly appearance. The sprouts are attached to the very source of their life, so this is good! It keeps the sprouts especially fresh! Large or Small, Just Be Consistent. It can take a few minutes but right in the store, break off truly fresh Brussels sprouts from their stalks, unless the stalks are priced/sold as is, of course! You'll want to choose sprouts that are roughly equal in size. This is far more important than selecting "small sprouts" especially if you plan to cook the Brussels sprouts whole. I never get it when other cooks say, "Pick only the smallest sprouts." Really? Sure, chicken tenders are the most tender part of a chicken but do you really want to give up the wings? For me, everything in its time and place. Mostly, however, we find fresh Brussels sprouts already off the stalk, loose in bins or some times in pre-packed bags. I also appreciate the bags of Brussels sprouts from Sam's Club, of all places! Loose Brussels sprouts mean that the stem cuts can be a few hours or a few days old and thus a little gnarly. Some times the outer leaves are bruised or yellowed, too. First! Please do wash the Brussels sprouts well, even if planning to cut off all the exterior bits. Why? Because if there's anything unsavory on the outside, then just putting it on the cutting board will contaminate the board; anything that gets cut on the board is at risk of contamination, too. In addition, the knife will cut through the outer areas so will transfer any contamination into the interior areas. Be Sure to Allow Extra Time. NOW, choices. What you do next depends on how you expect to cook the Brussels sprouts. The Magic of an X! Cut an X into the core with the tip of a knife, I usually get out a paring knife which has a thinner tip. If the sprout is large, cut deep into the core, just don't cut through the whole sprout. What's magic about an X? A cut deep into the core lets heat reach inside the dense core. This means the centers can fully cook without burning the outer leaves. It also releases some of the chemicals that make some people not like Brussels sprouts. Try it, truly! Maximizing Flat Surfaces for Caramelization! Cut the sprout in half, vertically, cutting right through the core. This means that during cooking, the heat needs to penetrate only half as far so the sprouts will cook evenly. But it retains the flat surface that's so important for creating the crusty edges that are ever so delectable. If you like, slice into the core a bit with the tip of a knife so that the heat can penetrate. Some times, a recipe will suggest cutting out the core with a deep V cut. This removes the core entirely so that the sprouts will cook still more quickly. If the sprouts will be tossed in a sauce, you might want to twist the sprouts to open up the leaves a bit so that the sauce has more surface area to coat. But cutting out the core means throwing away a lot of the edible sprout – so wasteful. Life is full of choices! Instead of cutting out the cores, cut the halves in half again (for quarters) or into thirds (for sixths). These will cook still more quickly (and retain some flat edges) but won't be as wasteful as removing the cores. To cook Brussels sprouts the most quickly, a quick sauté, say, you want the thinnest pieces. You might start with a whole sprout and cut it crosswise into thin rounds – although I don't recommend this, for it concentrates the cores into just a few slices, rather than spreading them around. Instead, first cut the sprouts in half lengthwise, then place a half facedown on the cutting board and cut it crosswise in thin strips. With your hands, twist off the outer layers of leaves, then break apart the centers. I hope this step-by-step guide is useful to you! If so, considering sharing in the usual places, Facebook, Pinterest, etc. 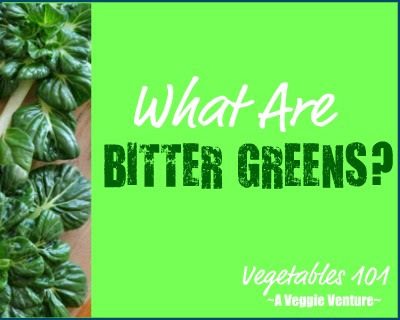 And to help you wrangle with other vegetables, check out these other photo guides! Together, we won't let these vegetables get the best of us! How to Cut Corn Off the Cob, Keeping All Ten Fingers, Capturing Every Delicious Kernel and Every Drop of Sweet Corn "Milk"
Main image adapted by me, original from Marco Verch on Flickr, used with thanks via Creative Commons. Now I'm hungry for brussels sprouts. Nice pan-roasted ones. Yum. i just posted about a new bs recipe i tried last week. check it out. http://foodwithkidappeal.blogspot.com/2010/01/wilted-brussels-sprouts-with.html i stumbled this. brussel sprouts are one of my favorite veggies. i love roasting or pan-searing them! Great pictures, never thought about how best to cut these things up. I usually roast them as that is how I learned to eat (and love)so many veggies that I would never touch as a kid. Thanks for the links to other recipe options I think we are grown up enough now to branch out and try cooking them in other ways! Thank you so much for posting this! I'm not a tremendous fan of sprouts, but my husband and daughter are, so I'm trying to work them into our meals more and never know how to cut, what to cut, how to prepare. This was so timely! 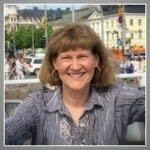 Hi just found your blog! Love it! I never loved brussel sprouts, but recently shredded them and just sauteed them in a bit of olive oil and salt and pepper for 4 minutes and they were fantastic! I love, love, love roasted brussels sprouts, but I sure wasn't spelling it right. I need to link back to this tutorial when I post about them. Thank you for the great info. Youd have to be retarded not to be able to figure this out on your own. Gina ~ Good idea! In fact, to skip the pictures entirely, you might check the “text only” print version. It’s hard to know what to leave out but I really do appreciate this viewpoint, I’m always after the “meat of it” myself on something like this.